In the maritime tort context, product manufacturers now have a duty to warn when their products require the incorporation of a part—such as asbestos—that the manufacturers know or have reason to know will likely make the integrated product dangerous for its intended use. Rejecting both the "mere foreseeability" rule and the "bare metal" defense as going too far, the U.S. Supreme Court by a six-to-three margin adopted a new, middle-of-the-road approach to product manufacturers’ duty to warn in the maritime tort context, holding that manufacturers have a duty to warn when: (1) their products require the incorporation of a part (such as asbestos); (2) they know or have reason to know that the integrated product is likely to be dangerous for its intended uses; and (3) they have no reason to believe that users of the product will realize that danger. In so holding, the majority affirmed the holding of the U.S. Court of Appeals for the Third Circuit—albeit without agreeing the lower court’s rationale—which adopted a fact-specific standard that considers the foreseeability of whether hazardous asbestos materials will be used with the bare metal manufacturers’ products (Air & Liquid Systems Corp. v. DeVries, March 19, 2019, Kavanagh, B.). Two Navy veterans who had been exposed to asbestos while serving aboard naval vessels developed cancer and died. Their widows and families filed strict products liability and negligence claims against various manufacturers that had produced equipment for those vessels—including pumps, blowers, and turbines—alleging that the equipment makers had a duty to warn when their products required the incorporation of a part, such as asbestos, that the manufacturer knew was likely to make the integrated product dangerous for its intended use. One subset of manufacturers produced "bare metal" goods—i.e., goods shipped without asbestos-containing materials—that later had an asbestos-containing component added. In response to the widows’ claims, the manufacturers asserted the so-called "bare metal defense," arguing that they could not be held liable because their products did not contain asbestos when originally produced. A federal district court in Pennsylvania agreed and entered summary judgment in favor of the manufacturers, after which the families appealed. Noting a split among federal appellate circuits on the issue, the U.S. Court of Appeals for the Third Circuit held that the bedrock principles of maritime law regarding the safety and protection of sailors required the adoption of a fact-specific standard over a bright-line rule in asbestos-injury negligence cases against the manufacturers of "bare metal" products that did not contain asbestos when made, but were later used with or were dependent upon asbestos-containing products or materials [see Products Liability Law Daily’s October 4, 2017 analysis]. In adopting a fact-specific standard, the Third Circuit vacated the federal district court’s ruling, which had applied the bright-line test and had concluded that bare metal product manufacturers could never be liable for asbestos-related injuries. The panel remanded the negligence claims for review under the fact-specific standard, under which the issue to be considered was whether the facts of the case made it foreseeable that hazardous asbestos materials would be used with the bare metal manufacturers’ products. The bare metal manufacturers filed a petition for certiorari, which was granted by the U.S. Supreme Court [see Products Liability Law Daily’s May 14, 2018 analysis]. Circuit split on duty to warn principles. According to the High Court’s majority, federal and state courts have not reached consensus on how to apply the general "duty to warn" tort-law principle when a manufacturer’s product requires the subsequent incorporation of a dangerous part in order for the integrated product to function as intended. Instead, three separate approaches have emerged. 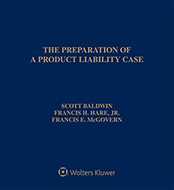 The first approach is the more "plaintiff-friendly" foreseeability rule adopted by the Third Circuit in the instant case, pursuant to which a manufacturer can be liable when it is foreseeable that its product will be used with another product or part, even if the manufacturer’s product did not require the use or incorporation of that other product or part. The second approach, a more "defendant-friendly" bare metal defense, was presented by the manufacturers in the case at bar. Under the bare metal defense, if a manufacturer did not itself make, sell, or distribute the part or incorporate the part into the product, then the manufacturer is not liable for harm caused by the integrated product, even if the product requires the incorporation of the other part and the manufacturer knows that the integrated product is likely to be dangerous for its intended uses. The third approach, which falls between the first two approaches and which the majority of justices found was the most appropriate in the maritime tort context, provides that the foreseeability that a manufacturer’s product can be used with another product or part that is likely to be dangerous is not, by itself, enough to trigger a manufacturer’s duty to warn. Instead, the duty to warn arises when the manufacturer’s product requires the incorporation of a part and the manufacturer knows or has reason to know that the integrated product is likely to be dangerous for its intended uses. Under that approach, the manufacturer can be liable even when the company does not itself incorporate the required part into the product. Middle-of-the-road approach. In adopting the third approach, the majority agreed with the manufacturers that a rule of mere foreseeability is too broad because many products can foreseeably be used in numerous was with numerous other products and parts. Requiring a product’s manufacturer to imagine and warn about all of the possible uses—with massive liability looming for failure to correctly predict how its product might be used with other products or parts—would impose a difficult and costly burden on manufacturers, while simultaneously "overwarning" users. In light of that uncertainty and unfairness, the justices rejected the foreseeability approach in the maritime context. The majority also agreed that the manufacturers’ bare metal defense goes too far in the other direction, explaining that there is no reason under maritime law to distinguish between a manufacturer’s duty to warn when its product is dangerous in and of itself and the manufacturer know or has reason to know that the product is dangerous or is likely to be dangerous for the use for which it was supplied, as well as those situations in which a manufacturer’s product requires the incorporation of a part that the manufacturer knows or has reason to know is likely to make the integrated product dangerous for its intended uses. According to the majority, the product manufacturer often is in a better position than other parts manufacturers to warn of the dangers posed by the integrated product because the product manufacturer knows the nature of the ultimately integrated product and typically is more aware of the associated risks. Furthermore, the burden of issuing a warning in terms of time and money is not significant, the justices concluded. Product manufacturers already have a duty to warn of the dangers of their products, so requiring them to add a warning when they know or have reason to know that a required later-added part likely will make the integrated product dangerous for its intended used should not significantly add to that burden. The majority rejected the manufacturers’ arguments that requiring a warning even when they have not incorporated the part into the product themselves will lead to uncertainty about when they must provide warnings and that requiring a warning in these circumstances would lead to excessive consumer warnings. The manufacturers failed to point to any substantial confusion in those jurisdictions that have adopted this approach, and the rule as adopted in the case is tightly "cabined" in that it requires a warning only when products require a part in order for the integrated product to function. Furthermore, because the rule applies in certain narrow circumstances, it will not require a plethora of new warnings. Furthermore, the rule requiring product manufacturers to warn when their products require incorporation of a part that makes the integrated product dangerous for its intended uses—and not just when the manufacturer itself incorporated the part into the product—is especially appropriate in the maritime context because maritime law has always recognized a "special solicitude for the welfare" of those who undertake to "venture upon hazardous and unpredictable sea voyages," the majority reasoned. As a final note of clarification, the Court stated that the maritime tort ruled adopted in this decision encompasses certain related situations in which: (1) a manufacturer directs that a part be incorporated; (2) a manufacturer itself makes the product with a part that the manufacturer knows will require replacement with a similar part; or (3) a product will be useless without the part—as long as the manufacturer knows or has reason to know that the integrated product is likely to be dangerous for its intended uses and the manufacturer has no reason to believe that the product’s users will realize the danger. Dissenting opinion. In his dissent, Justice Gorsuch, with whom Justices Thomas and Alito joined, pointed out that while the majority's new three-part standard represents an improvement over the Third Circuit’s unadorned "foreseeability" standard, it appears to suffer from many of the same defects that the majority identified with the appellate panel’s approach. First, neither of these standards enjoys meaningful roots in the common law, which has long taught that a manufacturer has no duty to warn or instruct about another manufacturer’s products, even though those products might be used in connection with the manufacturer’s own products. Instead, "the manufacturer’s duty is restricted to warnings based on the characteristics of the manufacturer’s own product." Second, the traditional common law still makes the most sense in the context presented because the manufacturer of a product is in the best position to understand and warn users about the product’s risks. By placing the duty to warn on a product’s manufacturer, courts have forced the manufacturer to internalize the full cost of any injuries caused by inadequate warnings—and, in that way, have ensured that manufacturers are fully incentivized to provide adequate warnings. By contrast, the incentive of a manufacturer to warn about the dangers of its products is diluted when other manufacturers are required to share the duty to warn and its corresponding costs, the dissenters explained. In addition, the traditional common-law rule better aligns with consumer expectations, the dissenters contended. As the majority acknowledged, encouraging manufacturers to offer warnings about other people’s products risks long, duplicative, fine-print, and conflicting warnings that will leave consumers less sure about which warnings to take seriously and more likely to disregard all of them. The dissenters also noted that the traditional tort rule is simple to apply because it affords manufacturers fair notice of their legal duties, lets injured consumers know who to sue, and ensures that courts will treat similar cases in a consistent manner. By contrast, when liability depends on the application of opaque or multifactor standards like the one announced by the majority, equality of treatment becomes harder to ensure across cases; predictability for innovators, investors, and consumers alike will be destroyed; and judicial courage will be impaired as the ability (and temptation) to fit the law to the case, rather than the case to the law, will grow, they maintained. Outlining the uncertainties sure to result from the majority’s new standard, the dissent asserted that these uncertainties are not cost-free, as the threat of litigation and liability will force many manufacturers of safe products to spend time and money educating themselves and writing warnings about the dangers of other people’s more dangerous products. Such actions can leave consumers worse off. In addition, the new standard implicates the same sort of fair notice problem that the court of appeals’ standard did. Decades ago, the bare metal defendants produced their lawful products and provided all the warnings the law required. Now, they are at risk of being held responsible retrospectively for failing to warn about other people’s products. It is a duty they could not have anticipated then and one they cannot discharge now, the dissent protested. On a final note, the dissent acknowledged that there is one "silver lining" to the new standard in that the majority expressly stated that it is not purporting to define the proper tort rule outside of the maritime context. Thus, in other tort cases, courts remain free to use the more sensible and historically proven common-law rule. The case is Docket No. 17-1104. Attorneys: Shay Dvoretzky (Jones Day) for Air and Liquid Systems Corp. Richard Phillips Myers (Paul, Reich & Myers, PC) for Roberta G. DeVries. Carter G. Phillips (Sidley Austin LLP) for General Electric Co.
Companies: Air and Liquid Systems Corp.; General Electric Co.